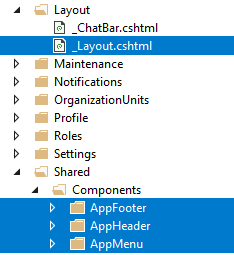 Application's main menu is defined in AppNavigationProvider class. See ABP's navigation documentation to have a deep understanding on creating menus. When you add a new menu item, it's automatically rendered in the layout. Main menu is rendered in menu component. Layout also highly uses bundling & minification (see the section below) system for script and style includes.